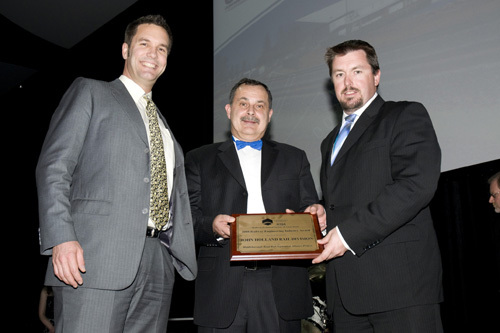 The 2008 Industry Award is made to John Holland Rail Division for the Middlesborough Road Rail Separation Project in Melbourne. This project involved the grade separation of the busy double-track Belgrave line and Middlesborough Road by some eight metres, the construction of two new bridges, a new train station, the installation of a re-designed signaling system, overhead traction current equipment and new trackwork. Remarkably, this complex $66 million project was completed in just twenty seven days – a timescale that many thought was not possible. The project not only has eliminated the previously busy level crossing with its inherent safety risks and improved the train service performance and track maintenance requirements through grade and curve easing but also it has resulted in major environmental benefits to local residents. All-in-all, the Middlesborough project is credit to all those involved. Honorable mention is made of this innovative project developed by the Institute of Railway Technology in collaboration with BHP Billiton Iron Ore Railroad. The instrumented revenue vehicles monitor aspects of railway operations on a day-to-day basis, and the fully-automated condition monitoring system records the current health of conditions throughout the network. The vehicle also collects key information for planning future maintenance and operational strategies.